Charleston, W.Va. – Bill Nye the Science Guy will be the next featured scientist in the Chancellor’s STEM Speaker Series lineup on November 19, organizers have announced. The series of events is organized by the West Virginia Higher Education Policy Commission’s Division of Science and Research. Bill Nye has spent most of his life making science and technology entertaining and accessible. Combining his talents as a scientist, inventor, comedian and author, he has attracted adults and children to the wonders of science. 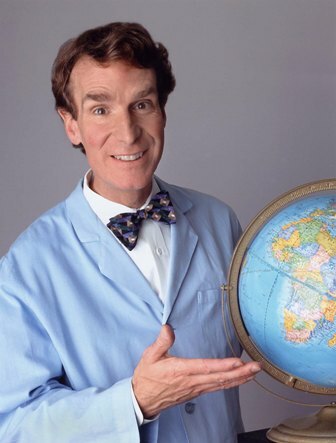 Nye’s wit and enthusiasm have helped to garner 18 Emmy awards for his PBS/syndicated series Disney Presents Bill Nye the Science Guy. Because of collaboration between the two organizations, this event will take place in the Maier Foundation Performance Hall at the Clay Center for the Arts and Sciences at 7 p.m. on Thursday, November 19, 2015. Tickets to the event are free, but must be reserved by contacting the Clay Center’s box office in person, online at tickets.theclaycenter.org or by phone at 304-561-3570. Tickets will be available beginning at 10 a.m. on Monday, Sept. 28, 2015. The Chancellor’s STEM Speaker Series is designed to promote the importance of research and the science, technology, engineering and math (STEM) fields to the general public in West Virginia. For more details about the event, visit wvresearch.org or call the Division of Science and Research at 304-558-4128. In addition to the Clay Center, support for the event is provided by partners Marshall University, West Virginia State University, West Virginia University, the West Virginia Department of Education and the Arts, the West Virginia School of Osteopathic Medicine, the West Virginia Regional Technology Park, Fairmont State University, Concord University, Toyota, West Virginia University Institute of Technology, the High Technology Foundation and West Virginia Public Broadcasting. The Division of Science and Research directs the EPSCoR program in West Virginia, while also managing other state and federally-funded academic research programs across the state. The program provides strategic leadership for infrastructure advancement and development of competitive research opportunities in STEM disciplines.